What Is the Cordoba C5-CE? Conclusion – Will You Be Happy with the Cordoba C5-CE? Cordoba Music Group is known for being one of the top producers of acoustic and electric guitars. They focus on making instruments that are attractive, functional, and affordable, making Cordoba instruments a favorite among musicians around the world. Because they are designed in a traditional Spanish method, they are incredibly lightweight, durable, and resonant. 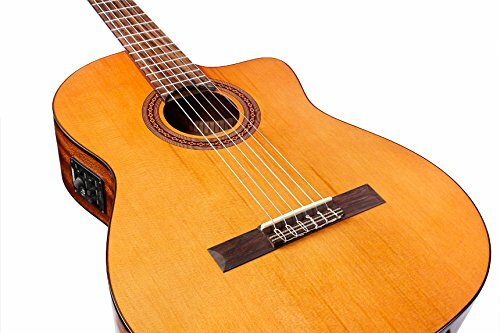 When you opt for a guitar from Cordoba, you get to choose from a wide variety of different tonewoods, colors, styles, and sounds, ensuring that you get the perfect instrument for your use. 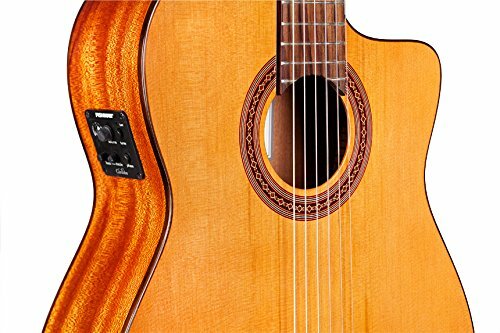 The Cordoba C5-CE is an incredibly affordable nylon-string acoustic-electric guitar. It is made from a combination of mahogany and Canadian red cedar, which were chosen specifically to provide the C5-CE with a lively presence and a very rich tone. It is in the Iberia series of Cordoba guitars and was based on the Spanish Classic guitar. However, the neck is a little thinner and the soft cutaway are deviations from this design. Such as all other Cordoba guitars, the C5-CE has an incredible pickup system to ensure that musicians can enjoy clear and bright tones with plenty of nuances when playing. The Cordoba C5-CE is designed for any musician who is going to be playing live music. 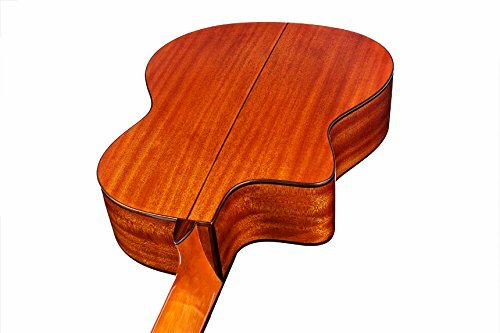 The slightly thinner neck makes it great for petite musicians who may struggle to easily hold the thicker neck on some guitars, and also makes it much easier for musicians to play faster notes, which is great for solo work. The lower cost of this guitar makes it much more affordable for beginners, although advanced musicians will also appreciate the power and sounds of the Cordoba C5-CE. Thanks to the powerful electronics on the Cordoba C5-CE, it can easily stand on its own for solo performances, but just as easily work in a band without being drowned out and covered up. This means that this guitar is great for use playing live gigs and even for use with the praise band on Sunday morning. The pickup system always produces a clear and natural sound when it is amplified, which makes it a great choice for recording and for live performances. The Cordoba C5-CE doesn’t ship with much, but it does have incredible strings when it ships, which means that musicians don’t have to worry about trading them out or upgrading. However, a hard case is important to protect the C5-CE, no matter if the instrument is in storage or you are taking it on the road for a gig. Additionally, musicians will want to invest in an amp or PA system, cords, picks, a capo, and a computer, if they will be doing any editing. The clear sound of the Cordoba C5-CE sounds great in recordings, and using a powerful computer with music software will ensure that you get the best sound quality and final product. The traditional design of the Cordoba C5-CE makes this an incredibly attractive instrument both to look at and to play. The guitar features Spanish-style fan bracing instead of lattice bracing. This is because fan bracing lets the top of the guitar vibrate freely without sacrificing tone quality. The neck is made from a solid piece of mahogany. This ensures that musicians enjoy the most string energy transfer to the cedar top. Because of this, musicians don’t need to worry about their sound being muddled or distorted. Even though the strings are high quality, they do take some adjusting before they sound their best. Some musicians have reported buzzing when strumming, which can be frustrating but is fairly common with guitars. The Cordoba C5-CE is a great guitar for many musicians, but may not be perfect for a beginner who is in the market for a slightly less expensive option. In this case, the Cordoba C4-CE is a great alternative. It still offers the same amazing sound as the C5-CE and gorgeous appearance, but is a little less expensive. Thanks to the solid African mahogany top, the C4-CE offers a pure and rich tone. Another great alternative is the Yamaha NTX700. This acoustic-electric guitar has a nato neck, which adds a little different sound to the instrument when it is played. It also has high-quality electronics and pickups so users don’t have to worry about a muddled or a dark tone when they are playing. Thanks to the lighter color of this guitar, it appeals to a wide range of players. The color will likely darken slightly with regular use and exposure to the light, making it an even more mellow and attractive instrument. Any musician who is looking for an affordable guitar that looks and sounds amazing will likely love the Cordoba C5-CE. It is easy to hold and to play, which makes it a wonderful option for beginners. Additionally, the built-in tuner ensures that new guitarists are always in tune, giving them a boost of confidence and helping them to focus on their music, not on their guitar. Such as all other Cordoba guitars, the C5-CE is designed to impress and looks and sounds great when used on stage. It is also a wonderful choice for any recording musician who demands excellence and wants an instrument that will provide them with a crisp and clear tone when recording. The slim neck, attractive body shape and design, and the combination of different tonewoods really set the Cordoba C5C-E apart and make it a wonderful instrument. It can as easily be used at a gig as it can on Sunday morning and will sound great in both locations.